In the past I have gravitated to working on wood panels because I love the unique pattern wood grains have to offer. However, my wood supply had dwindled down one day and in an urgent pinch for materials, I grabbed the canvases that had been sitting in the corner collecting dust for years….most literally twelve years. I thought it would just be a temporary departure from my usual preferred materials, and to make the change more intriguing, wondered what it was I could do with canvas that I perhaps couldn’t do with wood. ‘Sewing’ immediately came to mind. How, I wasn’t yet sure yet, but the thought of giving it a try was intimidating and inspiring all at the same time. 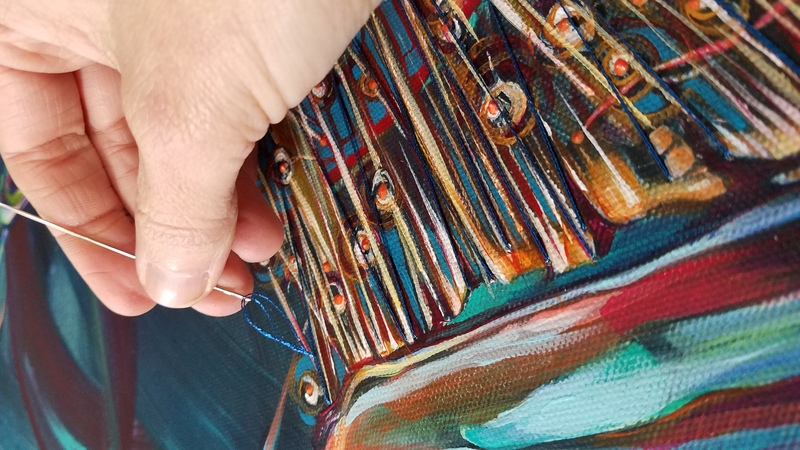 This idea of incorporating a bit of hand sewing into my latest canvas creations was ruminating, but the right time, or maybe just the courage required, had not yet come…until this particular piece which just seemed like it was requesting a little something else before being considered finished. 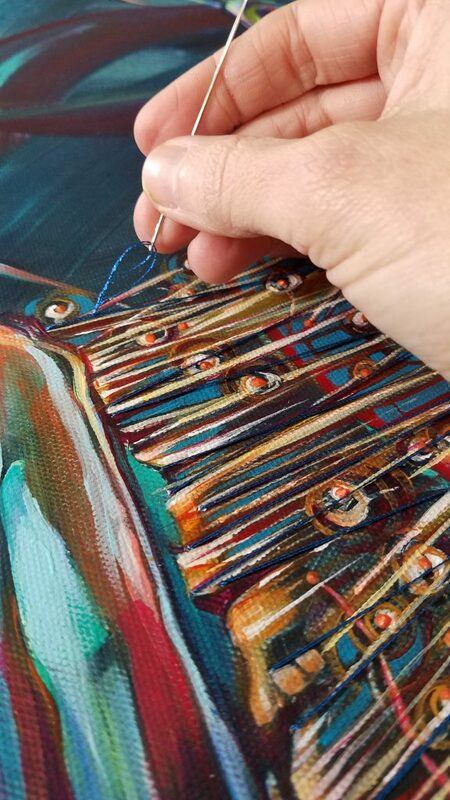 In the gradual process of carefully integrating needle and thread to its new supportive surface, I discovered something quite peaceful and calming despite stitching on top of what could have already been considered a completed painting. Now, the Neuron Series is taking a bit of an unexpected turn to expand its employment of materials by incorporating canvas, needle and thread.